From one Door to multiple estates managed by a single server instance - Ceequel® protects business premises, your intellectual property and your employees. 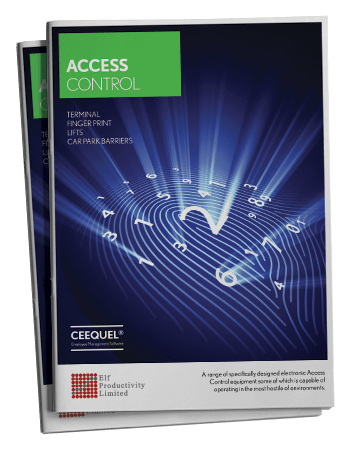 Ceequel® Access Control Software has revolutionised the way in which hundreds of companies keep their sites secure. Our access control software offers incredible versatility and enables you to limit access to areas of your organisation at the touch of a button. The Ceequel® Access Control Systems can operate over a Local or Wide Area Network allowing for a company-wide, all in one access control solution. Every access point can be given a list of personnel who are allowed access and each of these individuals can have their access limited to a specific time of day, days of the week or even days within the year. Access tables are controlled from a central point, so you can add and remove persons with a minimum amount of clerical effort. View our Access Control timeline to see it's usage over an average day. Ceequel® Access Control systems offer a fully integrated solution for all your access control needs by utilising the same ID cards and hardware as our Time and Attendance system. The data collected can be used exclusively for Access Control or in conjunction with Time and Attendance, Fire Register and Employee Tracking, thus removing the need for duplicate swipes. Our access control systems also share the same database with our other modules, including Time and Attendance, Human Resources and Employee Productivity Tracking. Such integration means that employee data is stored once in one database for all systems, making for a robust, secure database, where everything is connected to a single source. Once a leave date is entered into any one of the modules, the employee's card will prohibit access as of that date. Where required, access times can be linked to the employees' shift patterns themselves and access can be restricted when an employee returns to work after a particular type of absence, something of particular use within the food industry. All access permissions can be set up within time and attendance and these can be based on an individual, group or shift pattern basis making our access control system a truly unique and fully integrated solution. There are various types of security mediums available for identifying an employee including proximity cards, fobs, fingerprint biometric or simple barcode readers. Where a card is used, our access control solution includes an additional software package that allows you to design a company ID card from the ground up including logo, name, department, photo and so on. This one card can then be used for access to the premises, time and attendance, sight identification and even cashless vending. This last feature allows the card to store and top up a predefined amount of money that can then be spent on the premises, in vending machines or in the canteen. Demands on companies are constantly in motion and it's sometimes important to be able to limit access to areas of their organisation where expensive stock and or equipment may be located or confidential information may be stored. Our package offers an effective way of both denying access and, just as importantly, allowing the efficient authorisation of entry. We can also offer the very latest in biometric fingerprint access control technology. Each access point can be keyed to a unique set of fingerprints so you can be absolutely certain that only the authorised personnel have permission to gain access to high security areas. Our hardware is weatherproof and has a fully integrated backup proximity smart card/fob reader. All communications utilise TCP/IP and when using multiple devices, the distribution of fingerprint templates is seamlessly integrated with Ceequel® Access Control. Where access control is being used to provide an accurate fire register there is always the issue of tailgating (where an employee holds the door open for the next person - removing the requirement for the next employee to swipe). We offer a number of innovative solutions to this potential safety risk such as the installation of a turnstile or, where this is not possible the inclusion of an infra-red beam to detect if more than one employee goes through the door. This will sound an alarm and/or send a message to the admin user. This allows administrators to collect fire register transactions from either the time and attendance terminal(s) or via simple reader plugged into a USB port on any PC which is normally located in the reception or main entrance. Health and safety are always on a company's mind and with our system software you can easily monitor and meet fire and safety regulations. Each door, barrier or turnstile can be identified as an area where transactions mark the employee in or out of the fire register and as these transactions are collected real-time, an accurate up to date fire register is always close to hand. Multiple fire muster points can be configured within the system and the fire register can be set to automatically print to any and all network printer(s), be emailed to multiple addresses or even sent to Blackberry or iPhone devices as soon an alarm is sounded. The system will also respond to the alarm by opening access control doors automatically. Since all the data is collected in real-time and is instantly accessible from a central location, you'll always have access to the most up to date information thus enabling a rapid response to situations as they arise. Managers and supervisors can see on screen employees as they arrive for work or in the event of an emergency, a list of all employees who are on site. Managers can also view date and time stamped data, letting them know when and where employees have been granted or denied access. This information can be retrieved through the main software or, if Ceequel® E-Manager module is installed, via any PC with Internet capability. We can provide all the hardware you'll need to make your site secure. Our range of specially designed electronic access control equipment is robust and capable of operating in the most hostile of environments. We can advise you on the selection of the most suitable and cost-effective solution for your requirements and we'll ensure that the equipment will be strategically positioned so that employees simply need to present their identification card and enter authorised areas with the minimum of fuss.